File plan manager provides advanced management capabilities for retention labels and policies, and provides an integrated way to traverse label and label-to-content activity for your entire content lifecycle – from creation, through collaboration, record declaration, retention, and finally disposition. 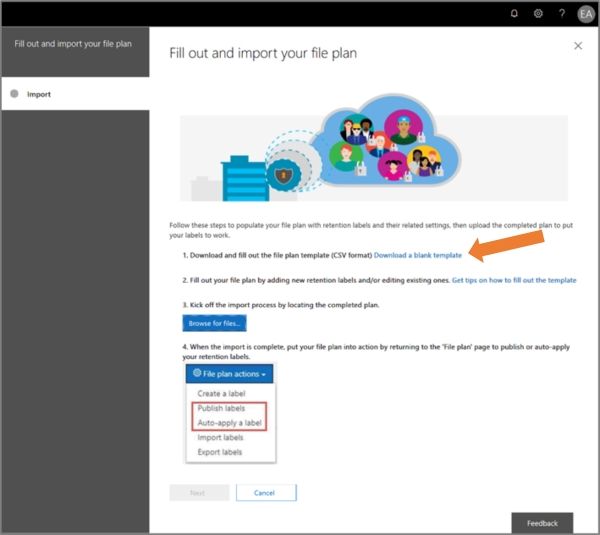 An Office 365 Enterprise E5 subscription. 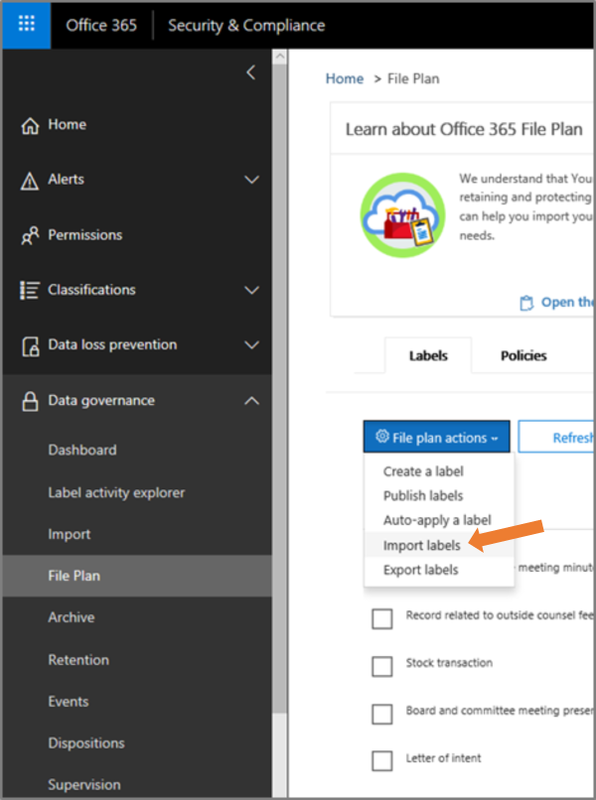 If there are no retention labels in the Security & Compliance Center, the first time you choose File plan in the left nav, this creates a label policy called Default Data Governance Publishing Policy. These retention labels are configured only to retain content, not delete content. This label policy will be published to the entire organization and can be disabled or removed. You can determine who opened file plan manager and kicked off the first-run experience by reviewing the audit log for the activities Created retention policy and Created retention configuration for a retention policy. Due to customer feedback, we have removed this feature that creates the default retention labels and label policy mentioned above. You will only see this policy and labels if you used file plan manager before April 11, 2019. 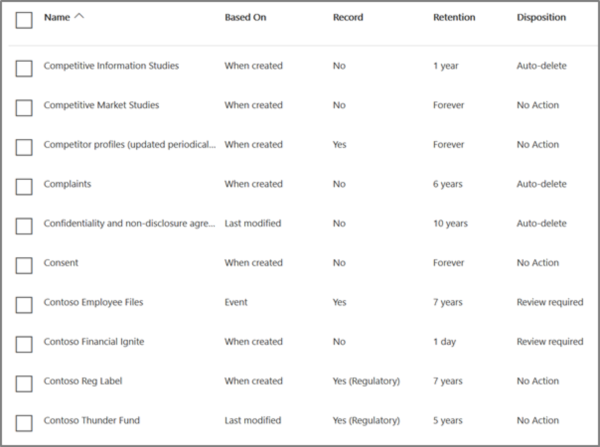 File plan manager makes it easier see into and across the settings of all your retention labels and policies from one view. 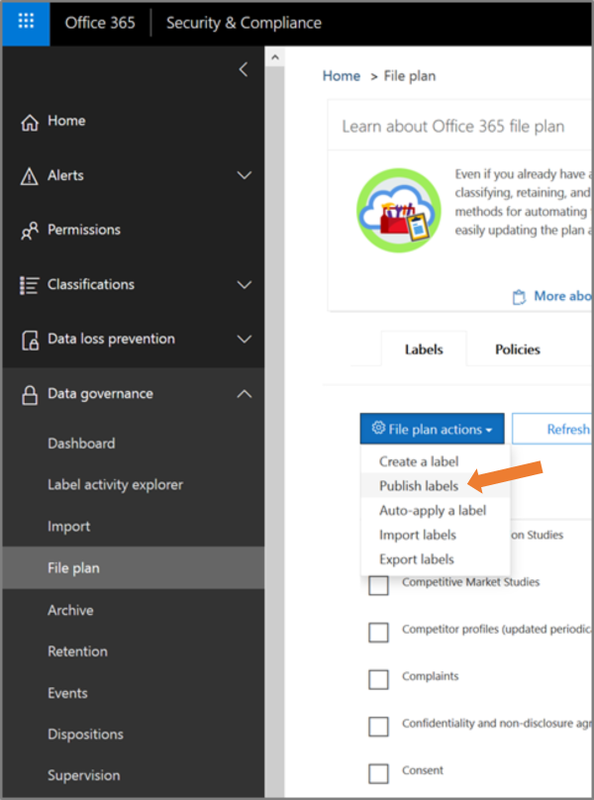 Note that retention labels created outside of the file plan will be available in the file plan and vice versa. You can now include more information in the configuration of your retention labels. Inserting file plan descriptors into labels will improve the manageability and organization of your file plan. 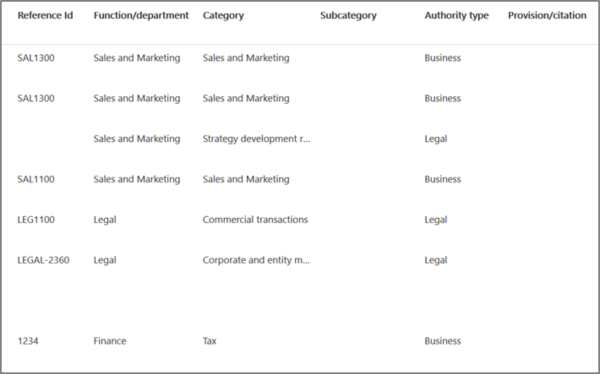 To get you started, file plan manager provides some out-of-box values for: Function/department, Category, Authority type and Provision/citation. You can add new file plan descriptor values when creating or editing a retention label. 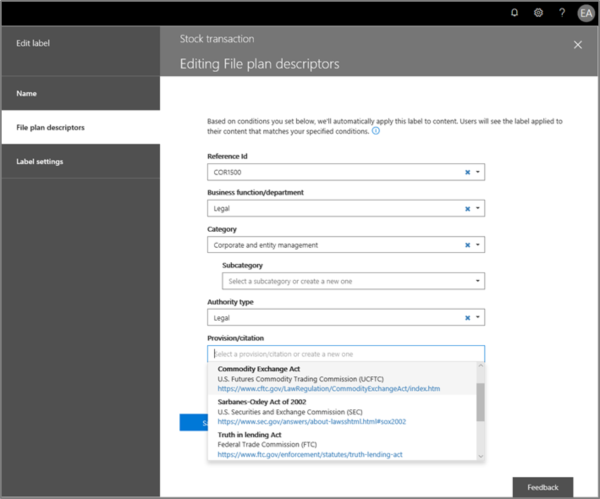 Here's a view of the file plan descriptors step when creating or editing a retention label. Here's a view of the file plan descriptors columns on the labels tab of file plan manager. From file plan manager, you can export the details of all retention labels into a .csv file to assist you in facilitating periodic compliance reviews with data governance stakeholders in your organization. To export all retention labels, go to file plan manager > file plan actions > export labels. A *.csv file containing all existing retention labels will open. From file plan manager, you can bulk import new labels as well as modify existing retention labels. 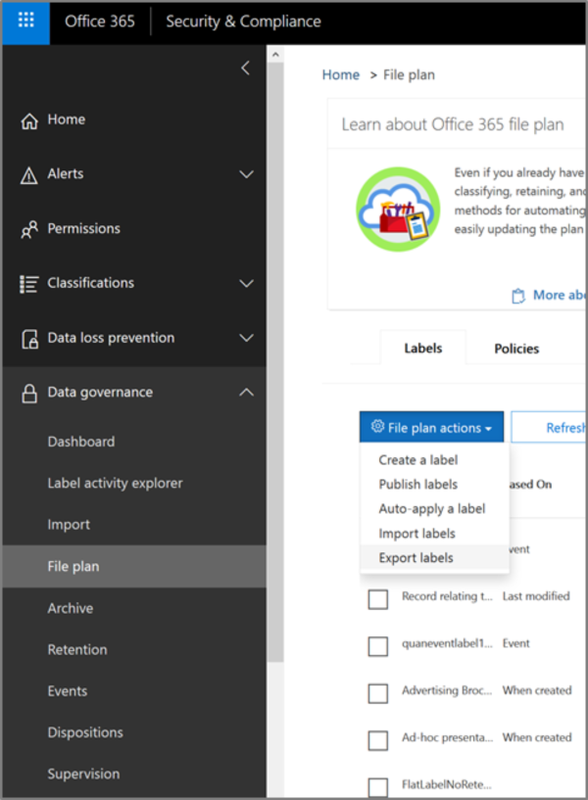 To import new retention labels and make updates existing retention labels, go to file plan manager > file plan actions > import labels. Download a blank template (or start from an export of your current file plan). Fill-out the template (coming soon is reference information about valid values for entries). 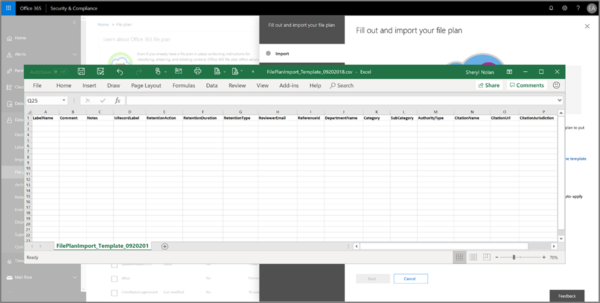 Upload the filled-out template, and file plan manager will validate the entries and display import statistics. When the import is complete, return to file plan manager to assign new labels to new or existing policies.